Today is the last day of 2013 and that means it's high time to talk about the books you read this year that have earned a special place in your heart! 1. For Darkness Shows the Stars by Diana Peterfreund: OMG YOU GUYS!! SO MUCH LOVE FOR THIS BOOK! How did noone make me read this sooner??? I basically had ALL THE FEELINGS reading this book! 3. Pivot Point by Kasie West: I cannot stop raving about this book. THIS BOOK! It made me smile and then it totally STOMPED on my heart and just need things to be fixed in Split Second ok? 4. Golden by Jessi Kirby: This was such an unexpected love! I read it on PulseIt because I was bored out of my mind with nothing to do at work and then I just couldn't stop reading and it was amazing and so, so beautiful! 5. Siege and Storm by Leigh Bardugo: OBVIOUSLY this book made my list! I LOVE this series and Siege and Storm did not suffer from second book syndrome and it was wonderful and left me with an enormous book hangover! Also: STURMHOND! If you haven't started this series yet, do it so you can have yourself some Sturmhond as well! 6. Ready Player One by Ernest Cline: I would have NEVER found this book without my bookclub at work. This was the first book we decided to read and oh wow was it amazing. I can't believe how much I loved this book and Wil Wheaton's audio narration. Check out my review here where I just gush about the whole thing. 7. Any Duchess Will Do by Tessa Dare: This book came out of nowhere for me. I tried a ton of new to me authors last year, and while Dare wasn't new to me, this series was. This is the third book and it was great. I think this book was one of the best because the characters and writing stayed with me over time. I talked about it in one of my roundups: The poignant parts are poignant, the funny parts are funny, and the sexytimes are hot. What more can you ask for? 8. Kiss of Steal by Bec McMaster: I am kind of in love with Steampunk, but when I read the books, they have been hit and miss. This was a hit! Such a fun paranormal and historical mix! Of course there is romance and it was great. I've loved the other books in the series as well and still have more to read. I did a full review of this one. 9. These Broken Stars by Amie Kaufman and Meagan Spooner: I saw this on Netgalley and it sounded interesting. And wow was it! It was less a space drama that I was expecting and more a survivalist story with two very interesting leads. It was seriously good and I can't wait for the other books to come out. Full review here. 10. Ender's Game by Orson Scott Card: This was another surprise for me, meaning I was really shocked how much I liked it. I was putting it off for so long, and I thought I knew too much to enjoy it. But I really liked this, though I am not going to continue with the series. I like how this book ended and I am satisfied. So much better then the movie. Full review here! So what about you all! Link up your best of 2013 lists here!! I loved These Broken Stars too, I'm so excited for the sequel! Oh, nice list(s)! I enjoyed THESE BROKEN STARS this year too, and I know I need to get to PIVOT POINT. Pivot Point is one of those books that I began not really knowing what to expect but I fell SO HARD for it and read Kasie West's other contemporary this year and liked it quite a bit too - I think I can say I'm a fan (: And yes, Sturmhond! Siege and Storm was amazing. Brilliant. Oh! I loved Pivot point and The Darkness Shows the Stars SO MUCH! Such fantastic books! And I'm dying to read These Broken Stars! It looks sooooo good! Great list! From reading it there are definitely a couple I need to check out! Siege and Storm made my list as well! STURMHOND!! XD So much love for him, and everything about that sequel really. So awesome. And I didn't realize that Wil Wheaton narrated Ready Player One. *_* I've been looking for a new audiobook to listen to, so THANK YOU!! :D I just put a hold on it at my library. Omg, so excited now. Also, holy wow - I read Ender's Game this year, too, and it blew my mind, and we are on the EXACT same page about not continuing with the rest of the series! The ending was so perfect, I don't want to spoil that! I can't wait for you to read Ready Player One. I want to mention it every day because I want more people to read/listen to it!! I must read Ready Player One, sounds great. Yay! I love getting more people to read that book. It was awesome! Ready Player One was my favorite book last year. It is quite popular this year in the library. I love it when kids read good lit. I think it's a good choice to not continue into the Ender series--it splits into a parallel series, one focuses on Ender and the other focuses on Bean. I've enjoyed the Bean novels more than the Ender sequel because they stay truer to the style that OSC had in Ender's Game, and the Ender sequels have a heavier, more philosophical emphasis instead of a military/political one. What a great list of read books. I've seen These Broken Stars but haven't gotten around to reading it. Yeah after I saw the movie, I asked my friend who had read more of the series what they were about. She mentioned the more philosophical turn as well. I am content that I read Ender's Game. If I did read any it would be the Shadow ones that star Bean. You have a wonderful New Year as well! Pivot Point and Golden look really good. Happy New Year, everyone! You have so many good ones here! I keep seeing Golden and I'm wondering if I shouldn't give it a try. Great list. Happy reading in the new year. 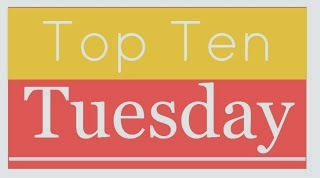 As always, loved the Top Ten Tuesday! Thanks for keeping things exciting! Great choices! I read a few of those and can see why you listed them. I've been meaning to read a few of those books that you've listed - hopefully I'll be able to read them soon! I totally agree about Ender's Game! I read that book a couple years ago, maybe two, and it was hard to put down. I'm not interested in reading the rest of the books in the universe because Card wrapped up the first book for me and I think the surprise of that book can't be matched again. The movie was disappointing, it felt like you were watching a two-hour preview, everything was happening so fast and there was zero character development. Yes! If I had not literally just finished the book I would have been super confused. It seems they translated the book too literally in terms of plot. Some of the dialog was word for word as well. But the problem is they didnt translate Ender well. We read from his perspective and watch him grow and change. The voice overs just didn't do it for me. This was definitely a hard post to do. For Darkness Shows the Stars, Ender's Game, and Pivot Point all made my list too! Great List!! I haven't read any of these, but Pivot Point and Ender's Game are both on my TBR list. I'm happy to see that you enjoyed them. I've only read Golden, Siege And Storm, and Ender's Game, but they're all awesome! A few of the books look really interesting, and I've heard so many good things about For Darkness Shows The Stars that I'm going to have to read it! Great list, and I hope you have a great 2014! I've been following the Top Ten Tuesday for i while now, and today made my first post of this on my blog :) Really fun meme! YAY for Seige and Storm and YAY for Ender's Game! SUCH GREAT BOOKS. Here's to a new year full of AMAZING books! I have to totally agree about Ready Player One. Just read it this month and loved it, made me laugh out loud all the time. Great book. Happy New Year! I would sit at home and just lay on my couch with my phone next to me, riveted. It was weird not being able to put an audiobook down, but it was just so great!! What a great topic for today! To be honest, it made me realize that I really need to read more in 2014! Pivot Point made my list as well! Tough one but I managed to get a list together. So many great books read and so little room on a top ten (or eleven...) list! I have quite a few of these on my to-read list! I always have a terrible time entering my info into the linky so I am putting my Top 10 right HERE LOL! Happy New Year! I loved Pivot Point as well. It almost made my list! I also loved Pivot Point, Darkness Shows the Stars, and Siege and Storm. Great picks! What an amazing list even though I haven't read any of these books, I have heard of them. Happy Reading and Happy New Year!! I've put mine up. Thanks for all the TTT fun this year, and I'm looking forward to lots more of it in 2014! Happy new year. Love taking a look at other's favourite lists- I keep adding to my TBR pile! I seriously think I'm going to try and read everybody's list! Great list! I really want to read Pivot Point! I read Ready Player One this year too, and I loved it! This is a great list. I really enjoyed Ready Player One this year too- I listened as I read and it was a great audiobook. . I feel this overwhelming desire to read For Darkness Shows the Stars right this second (first I have to go buy it). I definitely need to read The Bitter Kingdom and Siege & Storm. Excellent list. Ready Player One is on my list for 2014! Golden also made my list. I'm probably going to re-read it soon. I'm also trying really hard to convince myself to give Ender's Game another chance--it's not working so far. Since I've not read any of these, I'm off to add another 10 books to my to-read list! I really enjoyed Pivot Point it was also on my list of favorites for 2013. I did try to read For Darkness Shows the Stars and I didn't like it and I had to mark it as DNF. Glad you both found some great books to read in 2013 here is to more great books in 2014! I had to choose less than 10 books because I read no more than 31 books, so I wouldn't be very selective hehehe. Just finished the first two books in the Rae Carson trilogy and just about to start Bitter Kingdom. I also can't wait to read Pivot Point!